The SABR Black Sox Scandal Research Committee is pleased to announce a special symposium to commemorate the 100th anniversary of the 1919 World Series on September 27-29, 2019, in Chicago. This once-in-a-century event will be highlighted by a SABR research symposium with panels and presentations from 9:00 a.m.-1:00 p.m. on Saturday, September 28, 2019, at the Chicago History Museum. The museum is home to an extensive collection of Black Sox artifacts and documents, and we'll gather in the beautiful Morse Genius Chicago Room event space to discuss the continued relevance of the 1919 World Series and its aftermath. 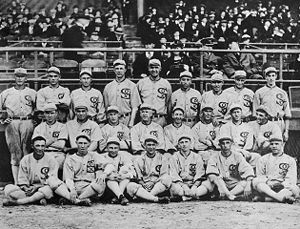 The weekend will also include a visit to see a Chicago White Sox game, a Prohibition era-themed dinner/pub crawl, a walking tour of downtown Chicago baseball history sites, and book signings with SABR authors, including our own Scandal on the South Side: The 1919 Chicago White Sox. Pre-registration for this event will be available at SABR.org beginning in early 2019. Sign up now to receive email announcements from the Black Sox Scandal committee for updates on this 100th anniversary symposium. This page was last updated September 28, 2018 at 1:48 am MST.